People with inflammatory bowel disease (IBD) may be at an increased risk for complications from the flu (influenza). We think of the flu being a common, benign illness, but it is far from being a harmless once-a-year problem caused by a virus. According to the Centers for Disease Control and Prevention (CDC), deaths from the flu vary widely every year because of the variation in flu seasons, but since 1976 death totals been anywhere between 3,000 and 49,000 a year. Most of the fatalities are in people over the age of 65. Immunosuppressive drugs are commonly used to treat IBD, and people taking these types of medications are considered to be at a higher than typical risk for developing complications from the flu. Because IBD is an immune-mediated condition, medications that suppress the immune system are sometimes given as a treatment. This is thought to keep the inflammation from IBD in check. However, this also means that the body is less able to fight off other types of infections, such as those that are caused by bacteria or viruses, including the flu (which is a virus). Bronchitis. Bronchitis is an infection of the airway (the bronchial tubes) that can cause a cough, wheezing, and fatigue. It may go away on its own in a few weeks, but it might also need treatment to resolve, especially if it's caused by a bacteria that can be treated with antibiotics. Ear infections. An infection inside the ear, which is also called otitis media, can occur after having the flu. Some of the symptoms include fever, ear pain, and dizziness or balance problems. Pneumonia. Pneumonia is an infection in the lungs which can occur after having a cold or the flu. It can cause pain when breathing, cough with sputum, and fever. Pneumonia can be especially dangerous for the very young and the very old. Sinus Infections (sinusitis). The sinuses, which are located around the eyes, can become infected, and it is a common complication of the flu. Sinusitis can cause a headache or facial pain, fever, and sinus congestion. A sinus infection may need treatment or it may resolve on its own. For people taking these or other drugs that suppress the immune system, the optimum time to receive a flu shot is from late October to mid-November, or even earlier if available. The flu shot should be scheduled well before the flu season starts to get busy because it can take one to two weeks for the flu shot to take full effect. However, the vaccination could be given even later, if necessary, because receiving a shot late is better than not getting one at all. 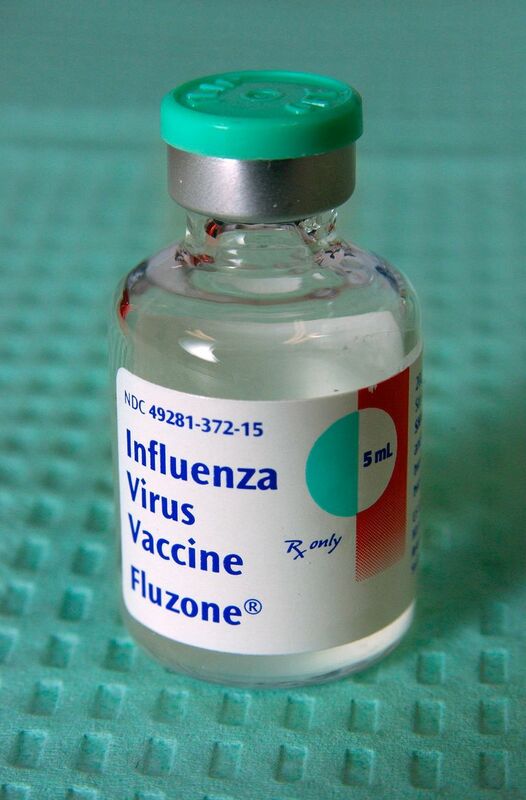 People taking immunosuppressive drugs should get the flu shot, not the nasal-spray flu vaccine (also called LAIV, which stands for Live Attenuated Influenza Vaccine). LAIV, which contains live, weakened flu viruses, is not recommended for anyone who has a chronic disease, including IBD. LAIV should also not be taken by anyone receiving medications that can weaken the immune system, such as the IBD drugs mentioned above. The inactivated flu shot contains dead viruses and will not give the recipient the flu. A flu shot is an important part of care for anyone who has IBD, in order to give the best chance of avoiding the flu and related complications. In most cases, IBD drugs should not prevent someone with Crohn's disease or ulcerative colitis from getting the flu shot. While it's never "too late" to get a flu shot, it's recommended that vaccination take place starting in October. The flu season spikes at different times across the country, and while it is somewhat predictable, it's best to get vaccinated early to have the best possible chance of avoiding the flu. Alsahli M, Farrell RJ. Opportunistic Infections in Inflammatory Bowel Disease. Crohn's and Colitis Foundation of America 14 Oct 2005. Centers for Disease Control and Prevention. "Flu Symptoms & Severity." CDC.gov. 19 Aug 2015. 11 Sept 2015. Melmed GY, Ippoliti AF, Papadakis KA, Tran TT, Birt JL, Lee SK, Frenck RW, Targan SR, Vasiliauskas EA. Patients with inflammatory bowel disease are at risk for vaccine-preventable illnesses. Am J Gastroenterol Aug 2006. 08 Oct 2007. Sands BE, Cuffari C, Katz J, Kugathasan S, Onken J, Vitek C, Orenstein W. Guidelines for immunizations in patients with inflammatory bowel disease. Inflamm Bowel Dis Sep 2004. 08 Oct 2007.